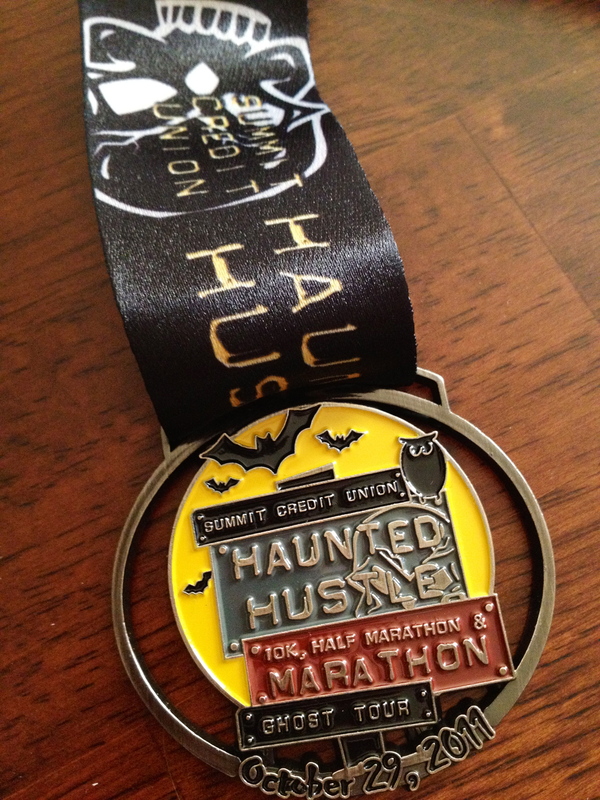 The 2011 10K Haunted Hustle medal. Once the pains of calf-ocolypse had finally been soothed, we decided it was time to get back into the swing of things and sign up for our first 10k race. This would be Meagan’s first race and my first race in over 10 years, but as intimidating as it was, the decision was one of the best we could have made because of the motivation it provided for us. We chose to run in the Haunted Hustle, a late-October race in Middleton, WI where runners often dress up in Halloween costumes. Many people are there just to have fun, which takes some of the pressure away and makes it the perfect race for beginners like us. This race, however, is also a Boston Marathon qualifier, so it was equally great for us to be around a few of the more serious runners and watch them as they finished the race. We signed up on August 18th, 2011. The run would take place just 2 1/2 months later on October 29th. This provided us with ample time to begin upping our mileage and increasing the number of times we ran per week. Before we signed up for the race, the longest run we had ever been on was a 5K, so over the next 2 months we had to work towards doubling our mileage. After weeks of training, it was finally October 29th and time to Hustle! The race was on a very cold morning and we were minimalist runners in a sea of heavily-cushioned shoes. Our goal for this race was never to win anything or even to place very high, it was only to finish and, because of our training, we did just that! We managed to arrive at the finish line in the middle of the pack and, thankfully, felt fantastic! I was extremely energized and felt as though I might be able to run another 10k, but decided to save it for another day. Today, we have much larger goals on the horizon. We have plans to do the 5K Color Run in Chicago after our return from our honeymoon (where I plan to do some actual barefoot running in Costa Rica) and later this summer, we hope to complete our first half-marathon at the Madison Mini-Marathon. Make sure to check back soon for Chapter 4 where Meagan plans to go into detail about the changes our feet have gone through since the beginning of our minimalist journey. You can subscribe below for future updates.